Learning braille is a skill that, like most, is best learned at an early age by those who need it. But toddlers with vision impairment often have few or no options to do so, leaving them behind their peers academically and socially. 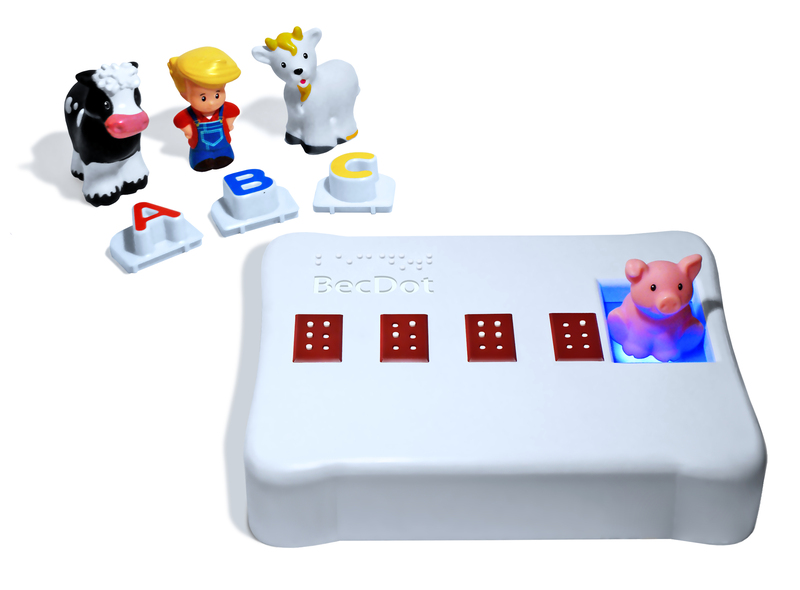 The BecDot is a toy created by parents facing that challenge that teaches kids braille in a fun, simple way, and is both robust and affordable. Beth and Jake Lacourse’s daughter Rebecca (that’s her up top playing with the prototype) was born with Usher Syndrome, a common cause of blindness and deafness. After finding existing braille toys and teaching tools either too basic, too complex or too expensive, they decided to take matters into their own hands. Jake happens to have a background in product design, having worked for years at a company that creates simple, durable environmental sensors. But this was a unique challenge — how to make a toy that doubles as a braille teaching aid? Months later, however, he had created a prototype of a production device, albeit with a one-off 3D-printed case. 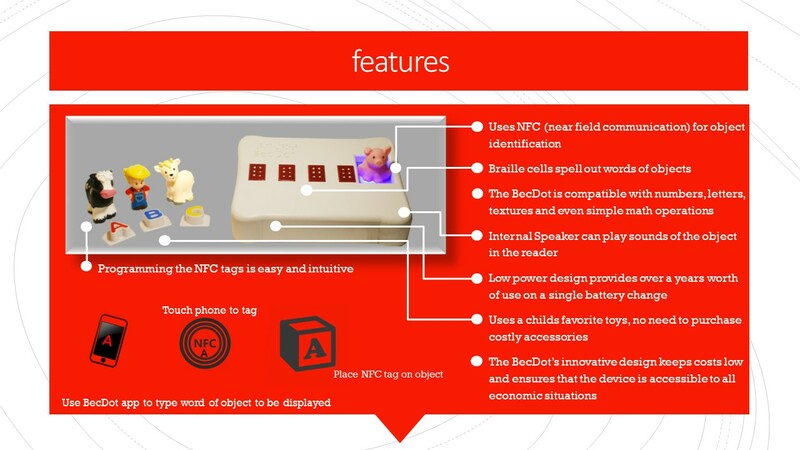 The BecDot has a colorfully lit surface on which toys equipped with NFC tags (programmed through an app) can be placed. Once the tag is detected, for instance on a toy cow, up to four braille letters appear, formed by lifted pegs: C-O-W. The device also can emit a sound uploaded by the parent or teacher. It’s simple, yes — as toys should be for kids this age. Yet it affords blind and partially sighted kids the opportunity to learn the alphabet and identify short words at the same time and in much the same way as sighted children. And with the sounds, lights and the possibility of integration with books and lessons, kids will likely find it plenty of fun. Here it’s worth noting that kids with disabilities often suffer doubly, first from simply not having the same senses or mobility as other kids, but secondly from the social isolation that results from not being able to interact with those kids as naturally as they interact with one another. This in turn causes them to fall further behind, isolating them further, and so on in a self-perpetuating cycle. This effect snowballs as time goes on, shrinking kids’ prospects of higher education and employment. We’re talking 70 percent unemployed here. The BecDot and devices like it could help short-circuit that cycle, both allowing kids to connect with others and learn on their own through play. One of the things holding back devices like this is the complexity and cost of braille displays. If you think what’s behind an LCD is complicated, imagine if every pixel needed to actually move up and down independently and withstand frequent handling. The braille equivalents of e-readers can cost thousands to display a sentence or two at a time — but of course kids don’t need that. Unsatisfied with the available options, Jake decided to engineer his own. He created a simple Scotch yoke mechanism that can control up to three dots at a time, meaning two of them can create a braille letter. It’s all controlled by an Arduino Uno. Simple means cheap, and the other parts are far from expensive; he told me that his bill of materials right now is around $50, and he could probably get it below $30. Such a low cost would make the BecDot highly attractive, I should think, for any school with vision-impaired students. And of course there’s nothing stopping sighted kids from playing with the gadget either, as I’m sure they will. Right now the BecDot is only in prototype phase, but the Lacourses sounded optimistic during CES, when I met with them. They’d been selected for a reward and exhibition by Not Impossible, an organization that creates and advocates for tech in the humanitarian space. Jake tells me their time at the show exceeded his expectations, and that they got a chance to speak with people who can help both move the device toward market and advance the message he and Beth are trying to get out. Toys like this (follow-up devices could have more letters or spaces for input) could help close the literacy and socialization gap that leads to many deaf and blind people being unemployed and dependent on others later in life. And having educational toys aimed at underserved, marginalized and at-risk populations seems obvious in retrospect. It’s a simple idea in some ways, but only made possible by a creative and innovative application of technology and, of course, love.